David asks what I thought of the movie Agora. Hollywood usually churns out bland (and increasingly re-fried) fare, consistently light on content or imagination, but this one promised to be different. It had so many attractive points for a history nerd- the early fifth century, the ‘Byzantine’ half of the Roman Empire, the most famous library of the ancient world, and the tension between the fading classical and emerging medieval worlds. 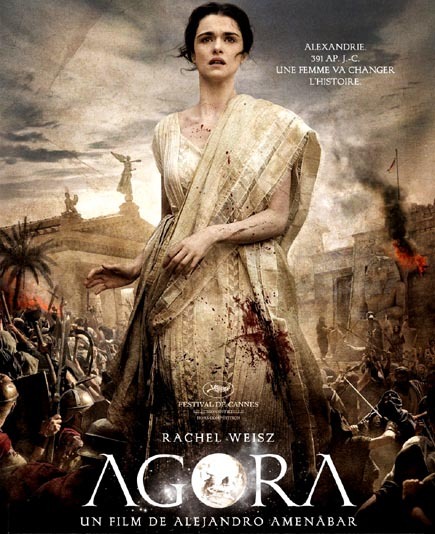 The movie re-tells the tale of the brilliant Hypatia, a female scientist/philosopher from Alexandria who was lynched by a mob in 415. It bases its account on Edward Gibbon who elaborated how the pagan Hypatia clashed with Cyril, the bishop of Alexandria who whipped up his followers into a superstitious fury and killed her- burning the great Library of Alexandria in their rage. Hypatia comes across as a virtuous defender of secular rationalism (desperately gathering scrolls to save them from destruction) against the rising tide of Christian intolerance and ignorance that was drowning classical culture. The only problem is that the story is complete nonsense. Beyond the fact that Hypatia was indeed a philosopher who was lynched in 415, there is barely a reliable detail to be found. Hypatia was a neo-Platonist who was hardly an opponent of the Church. Many Christians attended her classes and she had several very prominent bishops among her inner circle of friends. This was only natural since the heavyweights of Christian theology- Augustine, Ambrose, and Origen among others, enthusiastically supported neo-Platonism and viewed the pre-Christian philosophers as men who pointed the way to Christ without having all the details. In a sense they had come as close to the truth as possible without the benefit of revelation. In the fifth century Christian view the classical texts of Plato and Plotinus were valuable and needed to be preserved (that’s why we still have them today). To portray Hypatia as the noble champion of secular reason against the dark forces of religious superstition is just silly. But the movie seems to want to specifically push that stereotype. It parrots Gibbon- who was deeply anti-Christian and eager to believe any smear. He was the first to turn Hypatia’s death into a lynching by a Christian mob and he threw in the burning of the Alexandrian Library as the coup d’état of Christian ignorance. In fact, Hypatia was killed in a turf war between the two most powerful figures of Alexandria- Orestes (the Roman governor of Egypt) and Cyril (the newly-appointed bishop). They were feuding over ecclesiastic encroachment on secular authority and Hypatia was unlucky enough to be caught in the middle. After some of Cyril’s supporters were killed by Orestes’ henchmen, Hypatia (a vocal supporter of Orestes) was killed in retaliation. A terrible injustice, but hardly the victory of superstition over rationalism that the movie would have you believe. Most egregious of all, however, is the slanderous accusation that these ignorant Christians then pillaged the great Library of Alexandria. This unfortunate bit of mudslinging by Gibbon has been copied by nearly every anti-Christian polemic since, despite the lack of a single shred of evidence to back it up. Though it was one of the wonders of the ancient world, the Library of Alexandria didn’t even survive the Roman Republic. Half a millennium before Hypatia’s birth, it was destroyed by Julius Caesar when he was fending off Cleopatra’s brother/husband in 48 BC. A temple to the Egyptian god Serapis was built on the ruins and if it housed any scrolls they were destroyed in the riots of 391- a full 21 years before Hypatia’s death. Agora could have been a fascinating story- certainly the time period is interesting enough. Instead, it is yet another tired example of a progressive agenda that was already worn out in Gibbon’s time.